The O-Train Confederation Line will be a significant part of OC Transpo’s integrated transit network. 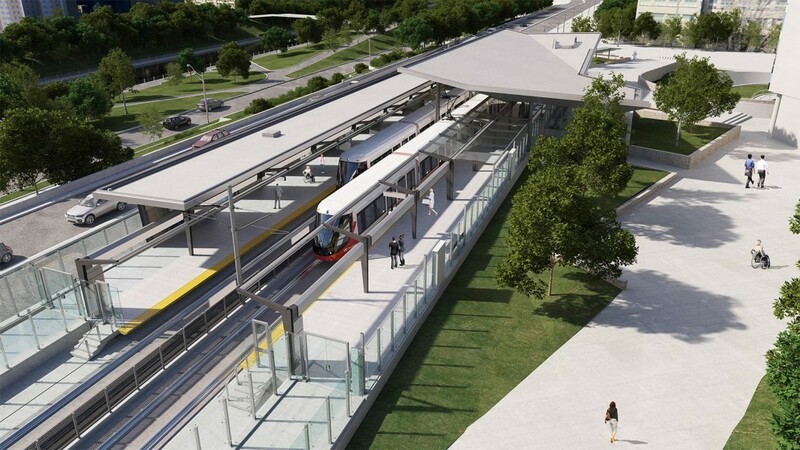 It will connect to the existing Bus Rapid Transitway at Tunney’s Pasture Station in the west and Blair Road in the east, and to the O-Train Trillium Line at Bayview Station. Together with a 2.5km downtown tunnel, this light rail system will move Ottawa faster and in more comfort than ever before. The O-Train Confederation Line is a transportation system worthy of one of the world’s leading capital cities. 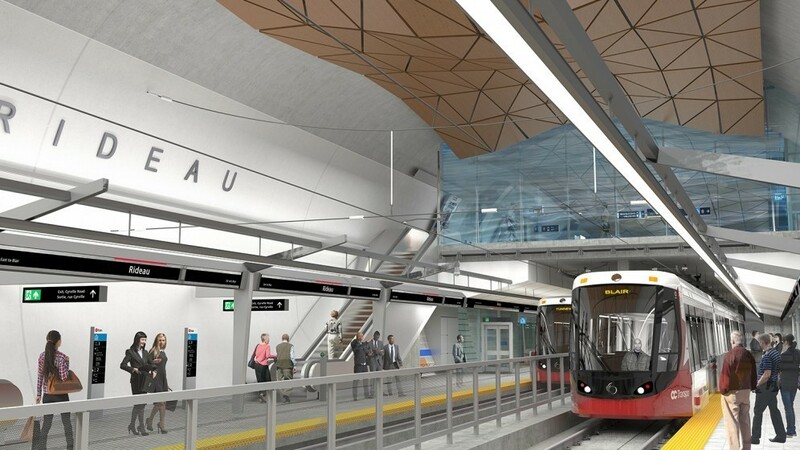 The 12.5 kilometre line from Blair Station to Tunney’s Pasture includes a 2.5 kilometre tunnel through the downtown core, 13 stations, a Maintenance and Storage Facility and the purchase of 34 Alstom Citadis Light Rail Vehicles. The O-Train Confederation Line Light Rail Transit (LRT) system will change the city’s landscape. Although each station will have common design features and cohesive architectural elements, they will also have individual artistic markings. The O-Train Confederation Line will be modern, safe, fully accessible and convenient. Each station will include necessary amenities such as bicycle parking, ticket machines, fare gates and a variety of accessibility and security features. For more information on all the features the O-Train Confederation Line will offer, please visit OC Transpo’s new “Ready for Rail” web section at www.octranspo.com/ready4rail. Located at Scott Street and Holland Avenue, Tunney’s Pasture Station will be the westernmost terminal of the O-Train Confederation Line. 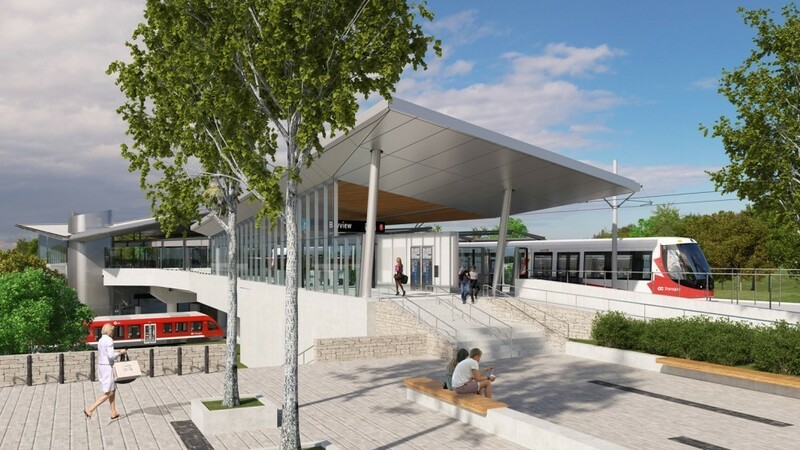 As such, the station will be a major transfer point for commuters from communities to the west and south of Tunney’s Pasture, providing easy and convenient connections between bus and train, and also serve the thousands of government employees who work nearby. The new design of Tunney’s Pasture Station will offer access points to customers using different modes of transportation to get to/from the station. There will be two entrances from the north, one adjacent to the integrated bus loop on the Holland Avenue overpass and the other to the northwest of the bus loop at Goldenrod Driveway. 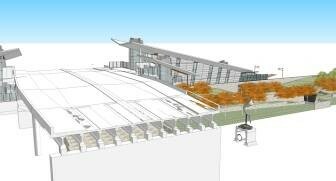 There will also be a third entrance on the south side of the station on Scott Street. All entrances will allow easy movement from station arrival to the concourse and fare gates, and will provide direct access, both east and west, to the platform below. Customers accessing the station by bus will arrive within the fare-paid area and can transfer between their bus and the train platform without having to go through fare gates. Tunney’s Pasture Station is where the Stage 2 LRT expansion to the west will start. Cycling and pedestrian pathways along the Ottawa River. Gradient Space consists of two large-scale glass mosaic wall murals on each side of the platform and one skylight element on the roof of the station. Derek Root’s idea for the Tunney’s Station artwork takes its inspiration from the phenomenon of light refraction. The title of the artwork, Gradient Space, refers to the effect of colour gradation that sometimes appears when light passes and refracts through a form made of glass. The artist imagined the transit passengers as being analogous to light. Like particles of light, each passenger travels toward and through the glass station, ultimately dispersing to their respective destinations. 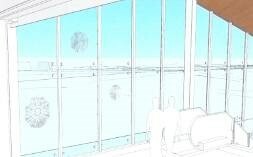 Glass is the principal material for the two-part integrated design. The mosaic wall mural is constructed using vibrant glass tile. The skylight design incorporates brightly saturated panes of laminated glass similar in layout to the wall mosaic. The composition employs vertical bands of colour gradients that are overlapped by diagonal bands of colour gradients. The gradation of angled tones gives a sense of movement and energy to the transit space. Derek Root (born 1960, Vancouver) is a graduate of the Emily Carr University of Art and Design. He has exhibited both nationally and internationally, including at Monte Clark Gallery in Vancouver, Union Gallery in London, and the Vancouver Art Gallery. His works are included in the permanent collections of the National Gallery of Canada, the Vancouver Art Gallery, the Canada Council Art Bank, and numerous others. Derek Root lives and works in Vancouver. Located off Albert and Scott streets near the eastern edge of the Hintonburg community, Bayview Station will connect the north-south Trillium Line and the east-west Confederation Line. Bayview Station will also provide pedestrian connections to Albert and Scott streets, the Tom Brown Arena, as well as several multi-use pathways along the Ottawa River. The tiered design of the station includes a western entrance located on the lower level, providing a direct connection to the Trillium Line with the Confederation Line train platforms located above. 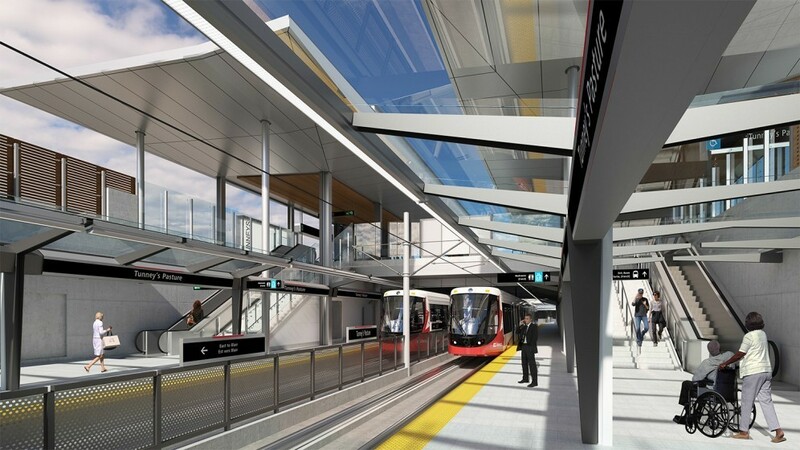 The eastern entrance will provide direct access to the Confederation Line eastbound platform level and to local bus connections on Albert Street. Bayview Station will be an important gateway to the surrounding community and future developments. A large new plaza area will connect the eastern station entrance and the bus stops on Albert Street. Bayview Station will have two art pieces, one integrated into the station’s design and one non-integrated outside of the station. As the Crow Flies is a 120-metre line drawing that traces alongside the train as it moves in and out of the station. Combining the rooflines of local architecture, a silhouette of the Gatineau Hills and the flight pattern of a crow into a single optical flow, the artwork serves to remind passengers of the history of the area and our ongoing relationship with nature. 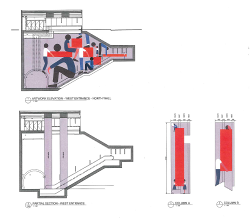 The artwork serves as an inter-track barrier through the full length of the station interior and is fabricated from tubular steel and fencing elements. The rooflines of houses within the artwork are specific to Mechanicsville, the neighbourhood immediately to the west of the station, so named for the mechanics who lived there and serviced the freight trains that pulled in and out of the train yards at this location. Also included are the distinct outlines of the Canadian War Museum, the Supreme Court Building, the Lemieux Island Water Purification Plant and the Terrasses de la Chaudière Complex on the Gatineau side of the Ottawa River. Coincidental to the references to architecture and nature is an ongoing interest in how the speed of modern transportation alters perception. Through the window of the train, our surroundings are unified into a single moving image, but are also set apart from us. The artwork distills the optics of rapid travel and presents it in minimalist terms for passengers on a train and those waiting on the station platforms. Adrian Göllner’s art practice is conceptual. His drawings, videos and public art commissions combine elements of abstraction, modernism and design in a manner that challenges perception and heightens the viewers’ sense of self and their surroundings. Göllner has had the fortune to receive twenty public art commissions and his artworks have been shown in solo and group exhibitions throughout Canada, the United States, Europe and New Zealand. He is the recipient of numerous grants and awards and his art is held in a wide number of collections. Cascades are laser-cut aluminum sculptures that draw from the rich historical context of the Chaudière Falls, located next to Bayview Station. Chaudière Falls is one of the earliest sites of human occupation in this country, holding great significance as an indigenous spiritual, cultural, and trading hub. Cascades celebrates this past and roots the future of Bayview Station’s transformation into a modern hub of spiritual, cultural and economic activity. The sculptures incorporate public seating while remaining rooted in history and nature, expressed through their curved lines and juxtaposition against the linear and industrial station – an act of reclaiming nature in our urban setting. Visually, Cascades seems to water the land around Bayview station in a symbolic gesture of new communities growing in the area. Cascades also creates a playful dynamic of lines and curves, while speaking to nature and sustainability. It reminds us that no matter our technological and industrial tendencies, we must respect and prioritize our land and water. Pierre Poussin’s approach to public art marries abstract concepts with practical functionality. His work incorporates a range of textures, vibrant colours, contrasting materials and a variety of shapes to elegantly link their surroundings and emphasize the character of each site. He draws his inspiration from the rich histories of the surrounding communities, the natural characteristics that make each site unique, and the ways in which people interact within these environments. He strives to create installations that reflect an area’s make-up, highlighting its diversity and the way in which people live, work and play in their respective communities. In the past, Poussin’s concepts have followed the same themes as those included in the Confederation Line stations: nature, history, community, movement, identity and technology. Located beneath the new Booth Street Bridge, Pimisi Station has been designed to incorporate an Algonquin cultural theme, reflecting both the historical and contemporary cultural significance of the Algonquin people. The Algonquin Anishinabe people and culture play a significant role in the station look, design and feel. The public artwork that will be installed at the station is being created by Algonquin artists and will reflect this theme. Pimisi means “eel,” which is sacred to the Algonquin peoples and has been an essential part of the culture for thousands of years, since it is considered a source of spirituality, medicine and nutrition. Pimisi Station has three levels. 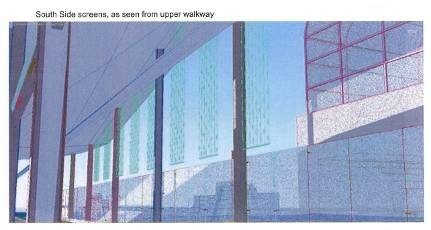 The upper street level, which features two of the three station entrances, will run along the Booth Street Bridge. The bridge passes over the light rail guideway, located one level below. 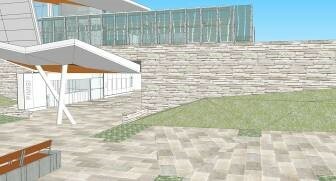 The third entrance will be on the lowest level, below the bridge, where customers will find a large public plaza. Existing multi-use pathways will lead directly to the lower level entrance, providing direct station access to cyclists and pedestrians. A separate stairway and elevator will connect the Booth Street Bridge level to the multi-use pathway below, allowing those who are not using transit to bypass the station. Pimisi Station will offer easy connections to bus service along the Booth Street Bridge. With its location near the Chaudière Bridge, it will also serve as a significant transfer point for OC Transpo customers travelling to and from Gatineau. Ideally situated as a key point of access for LeBreton Flats, Pimisi Station will also be at the heart of a number of key points of interest. It will offer easy access to the Canadian War Museum and the surrounding green spaces where major festivals like Bluesfest take place. Three escalators will serve the platform – two leading from the bridge-level entrances and a third from the lower level entrance on the station’s north side. Each of the integrated artistic elements at Pimisi Station pays homage to the Algonquin relationship to the land – specifically to the eel, the birch and the ash tree. The intent of artist Nadia Myre has been to both celebrate Algonquin culture and to remind visitors of the fragile ecosystem we inhabit. The eel is sacred to the Algonquin peoples and has been an essential part of their culture for thousands of years. It is a source of spirituality, medicine and nutrition. To mark that significance, an 8-metre tall chromed eel is being created as a beacon and a landmark at the station. Standing vertically in the aqueduct next to the station, the eel will be installed with its head diving into a fissure between rocks, its surface reflecting and disappearing into its surroundings. 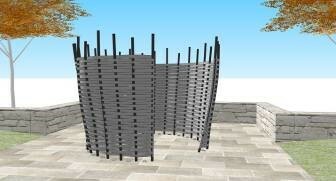 Facing the north entrance on the lower level plaza, a three-metre sculpture of a split-ash woven basket will serve as a welcome area for visitors. Because the basket signifies trade, shared knowledge and abundance, it will be an apt symbol for the space, designed as a meeting place. The row of birch trees windscreen replaces the location of a planned snow fence, running parallel along the east and west side of the train platform and will be fabricated out of tinted glazed panels. Nadia Myre, Kitigan Zibi Anishinabeg, is a visual artist from Montreal, Quebec. Her multi-disciplinary practice has been inspired by participant involvement as well as recurring themes of identity, language, longing and loss. A graduate from Concordia University (MFA, 2002), Emily Carr Institute of Art and Design (1997), and Camosun College (1995), Myre’s work has been written about in the New York Times, Washington Post, Canadian Art, Parachute, ArtNews and Le Monde. She is the recipient of numerous prizes including Les Elles de l’art (2011), CALQ: Création artistique – région Laurentides (2009) and Eiteljorg Museum Art Fellowship (2003). In 2013 Myre was given a prominent commission for Sakahàn: International Indigenous Art at the National Gallery of Canada. 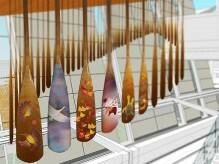 Occupying a place of prominence in the station’s concourse the installation Algonquin Canoe Paddle will feature 100 paddles, each hand-painted by Algonquin Anishinabe artists and arranged in the shape of a canoe. The piece is inspired by the Algonquin teaching that it takes many people to paddle a canoe. While the artists involved will be of all ages – youth, adults and elders alike – the project is being led by internationally known Algonquin artist Simon Brascoupé. Brascoupé will mentor four Algonquin Anishinabe artists – Emily Brascoupé-Hoefler, Doreen Stevens, Sherry-Ann Rodgers and Sylvia Tennisco – who will in turn conduct paddle-making and painting workshops in Algonquin communities throughout the region. The paddles created through that process will be featured at art exhibits both in Algonquin communities and in Ottawa before being installed at Pimisi Station. 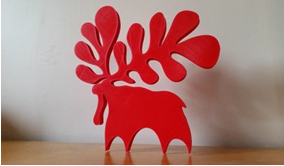 Brascoupé’s sculpture of a moose will also be installed at the west end of the Pimisi plaza. 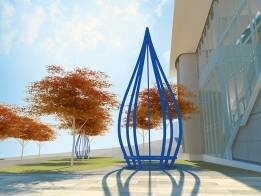 Measuring 3.7 metres in height, the sculpture will be big enough for passengers, pedestrians and motorists alike to enjoy. 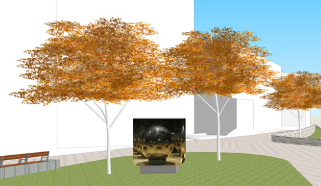 The sculpture, which will face the rising sun, will be red to represent fall colours and life. 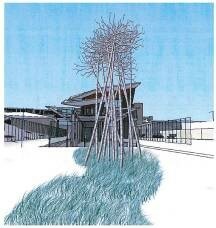 Pimisi Station will also feature designs inspired by the ancient art of Algonquin birch bark biting. This process traditionally involves using the teeth to create intricate designs on pieces of birch bark. Designs created by Brascoupé and other artists will be applied to the station’s glass windows. They will represent Algonquin teachings such as the sacredness of all things, relationships and seasonal cycles. Simon Brascoupé, Kitigan Zibi Anishinabeg, is the lead Algonquin artist on the non-integrated artwork at Pimisi Station. Brascoupé has exhibited art in China, France and the United States. He has worked closely with Algonquin communities and was a Community Curator for the National Gallery of Canada's Sakahàn: International Indigenous Art Junior Curators Program. As part of the Confederation Line project, he is also a mentor to the four Algonquin artists involved in creating the non-integrated artwork. Emily Brascoupé-Hoefler, Kitigan Zibi Anishinabeg, studied visual art and photography at the University of Western Ontario, graduating in 2003. Her work is displayed in several Algonquin artist exhibits. She has experimented with beads, birch bark and paint to produce multi-media paintings. Sherry-Ann Rodgers is Algonquin Anishnabe from Winneway and Barriere Lake in Quebec. She discovered her talent at a very young age and has been honing her skills through drawing, painting and crafts. She has displayed her work in a local artist exhibits. She specializes in portrait paintings with acrylic, but also loves creating experimental pieces of art. Doreen Stevens, Kitigan Zibi Anishinabeg, is an actress, singer-songwriter, spoken-word, multi-talented visual artist. She is a third-year student in the Indigenous Theater School in Toronto, and has been featured in various films and performance artworks throughout Europe, Australia, the United States and Canada. 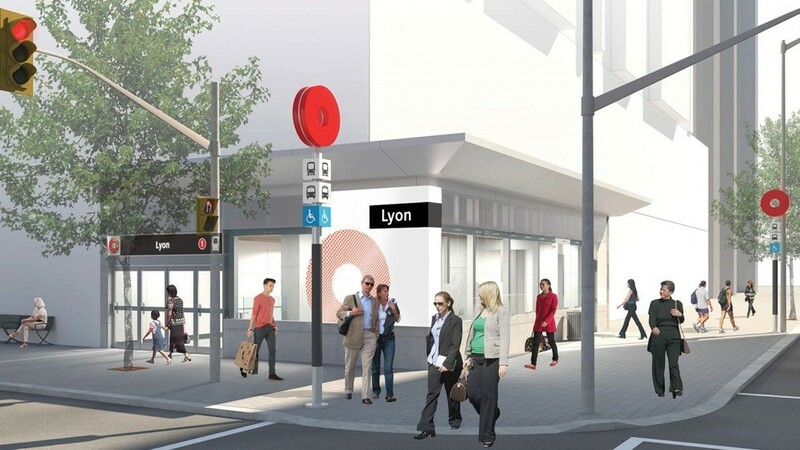 Lyon Station’s entrances will be located at the southwest corner of the intersection of Queen and Lyon streets, across from the Delta Hotel, and integrated into the Place de Ville complex on the north side of Queen Street. Lyon Station will be steps away from Library and Archives Canada, the Supreme Court of Canada, as well as major hotels, offices and the numerous shops, businesses and restaurants of Sparks Street. The station will also serve as the main connection point for STO customers travelling between Ottawa and Gatineau. Lyon Station’s two entrances are designed to accommodate peak customer volumes, with a platform for each direction. Both levels of the station will be served by escalators and elevators, making it accessible and convenient for all customers. To help customers differentiate between the three underground downtown stations, Lyon Station will have gold accent wall tiles on the train platform level. Fare gates and ticket machines equipped with customer help points to assist customers on their journey. Shops and restaurants of Sparks Street. Lyon Station will have one integrated and one non-integrated art piece. To celebrate Ottawa’s history (industrial, social, geographical, etc. ), the non-integrated piece celebrates the theme of “Bytown”. For this integrated piece, Artist Geoff McFetridge uses human figures as graphic elements to reflect on his impressions of contemporary life. Nearly typographic in their simplicity, the figures speak to the “house of cards” nature of living in a city. The people he portrays are both noise makers, and noise complainers. His people are equal collaborators in the pyramid scheme with no end that is life in the city. The artwork, placed at the west and the east entrances, will be applied directly to the station walls with a two-part epoxy paint and then treated with an anti-graffiti coating. Geoff McFetridge aims at creating a visual community by promoting ideas of unity and collaboration. With no distinctive characteristics or defining features, his figures are meant to portray a familiar and universal symbol of humankind that celebrates equality. The graphic qualities of these images can be read in a similar way to a puzzle as the viewer traverses the station during their commute. McFetridge's interventions with the space speak to social relationships and urge the viewer to cultivate a collaborative and inclusive attitude. Located in stairs and passageways, the images convey the sensation of movement referring to the fact that we are all part of the same transitional experience. In these murals, McFetridge invites us to look at the people around us from another perspective. Geoff McFetridge splits his time between commercial and studio projects. Known for his work as a graphic designer, he instinctively ignores creative boundaries. His work speaks with a graphic simplicity that is the fulcrum for a diverse art practice. In both his personal and commercial projects, he uses our shared visual language to try to create a personal dialogue with the viewer. His relationship with popular culture is one of participation; he strives to create work that moves between commercial and fine art contexts. His design studio Champion Graphics has created title designs for Spike Jonze and Sophia Coppola; shoes for Nike; carpets, wallpaper and blankets for the Standard Hotel; ceramics for Heath Pottery; snowboards for Burton and Salomon; a line of shirts for UNIQLO; and logos for Patagonia. He was part of the Beautiful Losers exhibit that traveled globally, as well as Art in the Streets at the MOCA Los Angeles. 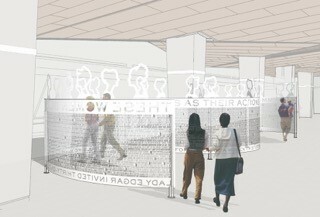 Located on the concourse level at Lyon Station, the non-integrated piece, With Words as their Actions, celebrates women as keepers of history – and in particular, the 32 women who, in 1898, founded the Ottawa chapter of the Women’s Canadian Historical Society (now the Historical Society of Ottawa). In 1954, Anne Dewar, a member of the society, presented The Last Days of Bytown, a lively documentation of life in the community a century earlier, when it was on the verge of changing its name from Bytown to Ottawa and becoming Canada’s capital. With Words as their Actions features Dewar’s 5,000-word text laser-cut into a curving, stainless steel curtain. Lines of text cut through on one side in English interweave with the French translation cut through on the other side, recalling the intricacy of hand embroidery and other fibre arts traditionally considered ‘women’s work’. Instead of reading this lacy curtain of words all at once, passengers can absorb a bit of it each time they pass through the station. The turned-out letters that add texture to the artwork also act as bookmarks, making it easy to ‘pick up where you left off’. Silhouettes of the society’s founders gathered in conversation preside over the curtain, passing knowledge to each other and to the viewer. PLANT is a collaborative practice that branches into architecture, landscape, research and design – with a special focus on creating work at the intersections of art, landscape, and built form. Our studio operates across spatial scales and disciplinary borders to reveal a site’s history and build important connections between people, places, and ideas. PLANT’s projects include the Canadian Firefighters Memorial in Ottawa, the Nathan Phillips Square Revitalization at Toronto’s City Hall, and site-specific artworks such as A Conversation of Views for Oakville Galleries and Channelled Buried Moved Lost for Cambridge Galleries. PLANT partner Lisa Rapoport led the With Words as their Actions design team. Born and raised in Montreal, she graduated in 1988 from the University of Waterloo’s School of Architecture and co-founded PLANT in 1997. Known for her passionate and rigorous approach to architecture and art, Rapoport frequently lectures in Canada and internationally on topics related to design and the public realm. 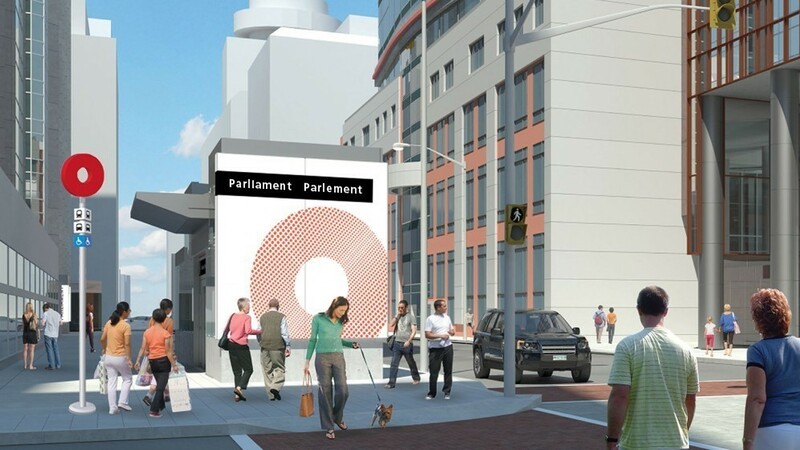 Parliament Station will have three entrances located at the corner of Queen and O’Connor streets. The east and west entrances will be integrated into nearby buildings (the Sun Life Financial Centre at 50 O’Connor Street and in 155 Queen Street), and the third mid-entrance will be located at the southwest of the intersection of Queen and O’Connor Streets in a free-standing bank of elevators. Parliament Station will be steps away from Parliament Hill, Confederation Square, the World Exchange Plaza and in close proximity to Ottawa’s downtown business district and the numerous shops and restaurants of Bank Street and Sparks Street Mall. Some STO routes (during peak hours only) will provide service in proximity to this station, allowing convenient connections for customers travelling between Ottawa and Gatineau. As such, Parliament Station is projected to have the highest volume of transit customers of all stations along the O-Train Confederation Line. This new underground station will be located roughly two stories below ground, with a single grand concourse hall that will give customers access to either of the two platforms at the east and west ends of the station. To help customers differentiate between the three underground downtown stations, Parliament Station will have multi-coloured accent wall tiles on the train platform level. The newly streetscaped Queen Street will accommodate the station’s entrances, and provide ample space for pedestrians, cycling and transit traffic and bicycle storage. Customers can connect to bus service on the south side of Queen Street with new customer shelters. 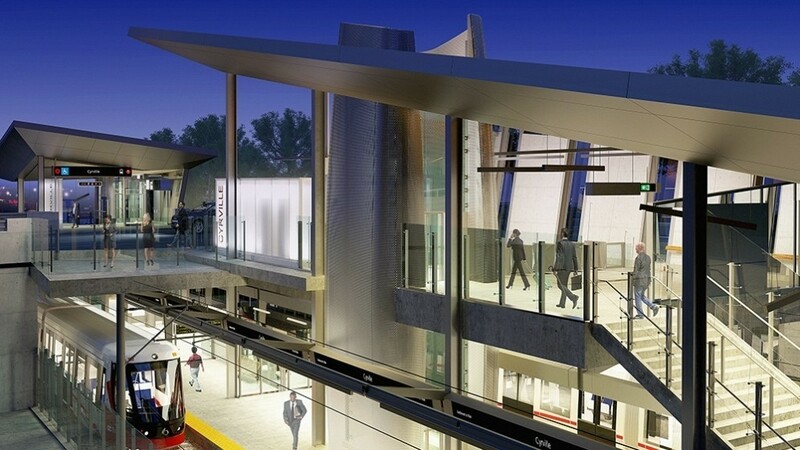 In addition to providing easy access to the downtown core, Parliament Station has been designed as a key transfer point for transit customers heading to Lansdowne Park, with transit connections at Bank Street located a few steps away. The World Exchange Plaza and many corporate office towers. Chosen to reflect the station’s proximity to Parliament Hill and Ottawa’s status as Canada’s national capital city, this station’s theme recognizes the National Capital Region, Canadian identity and/or the unique cultures of each province and territory. Douglas Coupland is a Vancouver-based author, artist and designer. He has written fourteen novels, numerous works of non-fiction and has been translated into most languages. Since 2000 he resumed a visual practise and his work is in a broad array of museums, as well as corporate and private collections. His first museum retrospective was held at the Vancouver Art Gallery in the summer of 2014. Trails: home and away is a series of 11 laser-cut painted steel panels, nine feet tall by 20 feet long, depicting the small, low growing plants that line the paths and trails across Canada. Each panel design describes plants specific to one of the many ecological zones of the country, starting toward the west end of the platform at Parliament Station with the Pacific Maritime and progressing through the Mountain, Arctic, Boreal and Prairie to the Atlantic. Nature has been a favourite subject matter for many Canadian artists. In many cultures nature has also been a place for renewal, a means in the search for meaning, an echo chamber of human feeling. Imbedded also in the story of landscape is the complex and inseparable link between nature and technology. It is the realization that it is technology itself, the very advances that make life and the world more accessible and more knowable, that may well be the very thing that will destroy it. As technology enables us all to know nature in more intimate detail than ever before, so, too, does technology distance us from it. Nature has been understood philosophically to be a place of balance and co-existence. For that reason, Parliament Station, the metaphoric centre of Canada, is the perfect place to explore and celebrate the ecological diversity of Canada in Trails: home and away. The sculpture proposes nature as a means for us to reflect on our world, our heritage and the role technology has to play. The first commuter trains in 19th century Paris and London married nature with technology. Plant motifs served to soften the repetitive and mass-produced steel elements. Ornamentation, based on natural plant life, became the link between the craftsman tradition and the new technology. The leaves, vines and flowers that adorned the new industrial steel were philosophically grounded in a celebration of human labour and its equation with nature. They energized the structures, celebrated the human and connected the new technological innovations with life itself. These new technologies were seen to promote social harmony and progress, in much the same spirit with which we see the development of public transportation as a social and environmental asset today. Jennifer Stead is a landscape painter/drawer. In her first exhibition in Ottawa, she drew a 120-foot long charcoal landscape drawing in the City Hall Art Gallery (2010); she has completed a number of public art sculptural commissions for the City of Ottawa since (Short Story, 2015, and Water, 2013). She completed her MFA at the University of Calgary and her BFA at the Nova Scotia College of Art and Design. Her work has been shown in both commercial and public venues. Jennifer Stead is the Executive Director and Curator at the Andrew & Laura McCain Art Gallery in Florenceville-Bristol, New Brunswick. The station is steps away from many of the Capital’s most popular tourist attractions and facilities, including the Rideau Canal, National War Memorial, ByWard Market, Château Laurier, Shaw Centre, Government Conference Centre, National Arts Centre, National Gallery of Canada, Arts Court, and much more. The station will also be within walking distance of the many shops, galleries, hotels, restaurants and businesses that make up the Downtown Rideau BIA and ByWard Market BIA. The three entrances to Rideau station will be located along Rideau Street: adjacent to the William Street pedestrian mall on the north side of Rideau Street, and within the Rideau Centre at the Friedman Mall and at Colonel By Drive. To help customers differentiate between the three underground downtown stations, Rideau Station will have blue accent wall tiles on the train platform level. Dedicated retail space to provide services and/or amenities for customers on the go. ByWard Market and Rideau Centre. With Rideau Station located in Ottawa’s downtown arts and culture district, and being in close proximity to both national and local arts institutions, galleries and theatres, a “Gallery” theme has been established with Rideau Station’s two integrated art pieces to acknowledge the power of art and the creativity of Ottawa’s arts community. The artist explains her integrated art piece as follows: “In conceiving my design for the project, I have drawn inspiration from the representation of landscape in the history of Canadian art, and from Glenn Gould’s conceptual affinity for the Canadian North as expressed in “The Idea of North,” a sound documentary made for CBC radio in 1967. The notion of the North, which has become a metaphor in the Canadian consciousness, is a symbolic location of the sublime. Through its allegorical conjuring of the immensity and beauty of Canadian nordicity, FLOW pursues and prolongs this line of cultural thinking. FLOW also evokes the significance of the Rideau Canal and its vicinity to the Rideau Station, as well as the importance of water in Canada’s history, rooted both in the vast area of our land that it covers and in the complex network of lakes and rivers that it forms, an inestimable wealth. Operating in a liminal zone between representation and abstraction, FLOW is designed to occupy the entire area of one of the concourse walls allocated to the artwork. The photographic image, featuring a shimmering and pictorially rich surface of water, is printed on the glass. The inner surface of the glass sheet will be inscribed with undulating silver-coloured forms that ripple across the main image. This graphic element, created through a serigraph process using a mirror-finish fritted ceramic, serves to enhance the dynamic and sensual materiality of the work. FLOW will gleam and shimmer depending on its viewed distance, like a natural landscape. An influential figure in Canadian art, Geneviève Cadieux constructs poignant photographic works and large-scale installations that test the limits of the medium while addressing the themes of the human body and the landscape in their mutual implication. Since 2003, Cadieux has been producing artworks in urban spaces redefining the photographic object. Featured in numerous solo exhibitions across Canada, the United States, Europe and Japan, Cadieux has also represented Canada at the Venice Biennale and participated in prestigious events, such as the 59th Minute: Video Art in Times Square, the Sao Paulo Biennale, and the Sidney Biennale. Solo shows of her work have been presented at: the Institute of Contemporary Arts, London; the Nouveau Musée, Villeurbanne; the Musée d’art contemporain de Montréal; the Sagacho Exhibit Space, Tokyo; the Musée Départemental de Rochechouart; the Tate Gallery, London; the Miami Art Museum; the Morris and Helen Belkin Art Gallery, Vancouver; and the Musée des beaux-arts de Montréal. In 2011, Geneviève Cadieux received a Governor General’s Award in Visual and Media Arts for the excellence of her artistic accomplishments. Title: The shape this takes to get to that (the grid, its daily interruption, and the possible options that exist). The artist explains his integrated art piece as follows: “Inspired by the existing subtle grid like repetition of large white tiles throughout the station, these works invert, interpret and imagine these simple forms enlarged, shifted, mirrored or repeated – offering a subtle graphic contrast and interpretation of the space while suggesting a new option or possibility in the mundane. The work consists of seven black tiled sections that contain geometric shaped outlines made of polished stainless steel rods. The steel catches the light and reads as white against the black of the tile, illuminating the shapes within. Reminiscent of blueprints, sketches, and architectural drawings, each minimal tableau provides a reminder of the opportunity for creation and change. My aim is to have the work sit in relation to, and to offer a visually pleasing connection and appropriate contrast with, Genevieve Cadieux’s work in the station. Using a similar palette of black and silver, the simple and clear graphic patterns in the work play off nicely against the photographic, subtle gradient, and translucent quality of Cadieux’s work. Jim Verburg is a Dutch/Canadian artist currently based in Toronto. With light as a primary inspiration, his works aim to give form to the ephemeral and intangible - using a range of methods and materials to create (deceptively) minimal and captivating layered compositions that mimic the delicate nuances of reflection, absorption, opacity, and translucence. Recent and upcoming projects include a choreographed work for the Toronto Dance Theatre (2016), a book project with Fw: Amsterdam (2018), solo exhibitions at Zalucky Contemporary, Toronto (2017), and Rodman Hall Art Centre, St Catharines Ontario (2018). He was recently awarded a prestigious Chalmers Arts Fellowship Research Grant (2017). He’s launched solo exhibitions at Mois de la Photo à Montréal (2011), widmertheodoridis (Zurich) at VOLTA New York City (2015), the Texas Contemporary Art Fair, Houston (2015), and Galerie Nicolas Robert, Montréal (2016), with group exhibitions at The Power Plant, Toronto (2013), Luciana Caravello, Rio de Janeiro (2014), Access Gallery, Vancouver (2014), and Inman Gallery, Houston (2015). He’s been an artist in residence at the NFB (National Film Board of Canada, Montreal 2008), G44 (Toronto 2009), The Banff Centre (2010), and Open Studio (Toronto 2014). His film For a Relationship won the 2008 Jury Prize for the Best Canadian Short Film at the Inside out Film Festival (Toronto), and was nominated for the Iris Prize (UK). His book O/ Divided/Defined, Weights, Measures, and Emotional Geometry, was awarded by Dazibao Montréal (2013) and was shortlisted for Best Printed Publication at the Gala des Arts Visual, Montréal (2014). Work from the publication was featured by Art Metropole at Art Basel Miami (2013). His most recent artist book A New Relationship Between Reflective Sides was launched at MoMA Ps1 at the New York Art Book Fair (2015), and was featured in the recent traveling Collectif Blanc exhibition Forme | Édition | Expérimentation (2016, Gatineau and Toronto). uOttawa Station will be located at the University of Ottawa, next to the Rideau Canal. 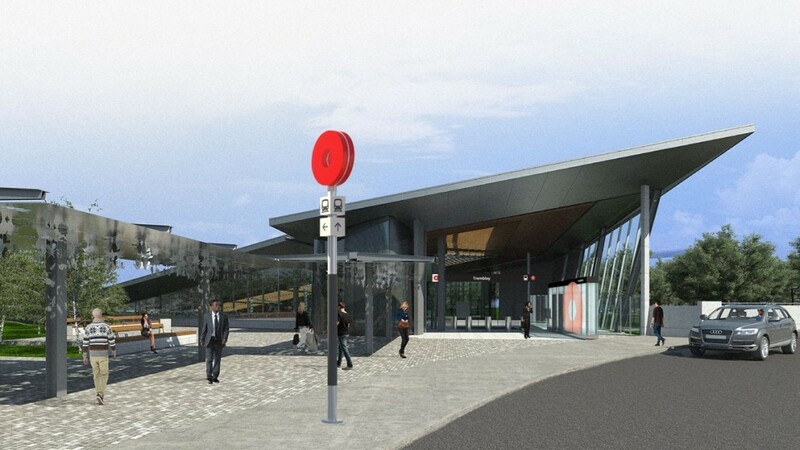 The new station will serve customers travelling to and from the University of Ottawa, but will also allow students to travel to Carleton University quickly by connecting to the O-Train Trillium Line at Bayview Station. Students will be able to travel between the two campuses within an hour. 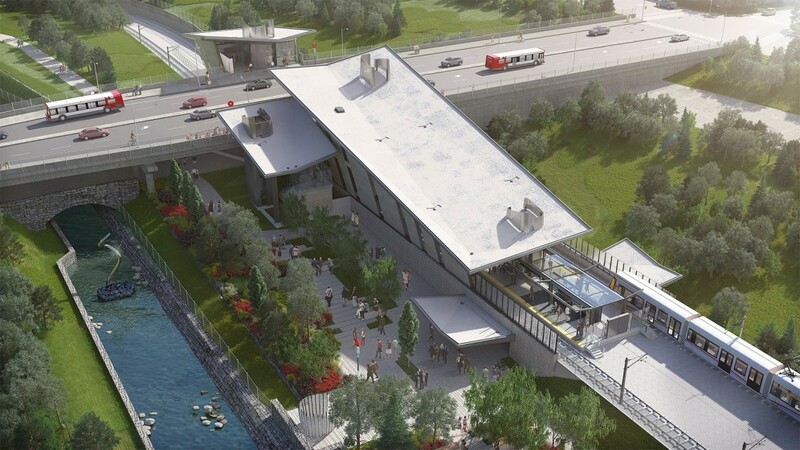 Customers waiting on the uOttawa Station platform or enjoying the new main level plaza will be able to take in the views of the iconic Rideau Canal year round and easily connect to pedestrian and cycling infrastructure nearby. The station will connect the existing Rideau Canal underpass to a new pedestrian plaza and multi-use pathway. Pedestrian connections will be enhanced by continuing and completing the multi-use pathways from the University of Ottawa and the Rideau Canal through the pedestrian underpass and over the Corkstown Footbridge. Customers will also be able to use the footbridge to easily access the Sandy Hill and Golden Triangle neighbourhoods. An expanded plaza area between Vanier, Caron and Marion Halls will also provide a convenient connection between the station and the university campus. An easy walk from Sandy Hill and the Golden Triangle. Located in the heart of an academic institution, uOttawa Station will embody the theme of “Innovation” as a hub for public art that speaks to creative innovation and social practice. The artist explains his non-integrated piece this way: “There is an interesting phenomenon that happens between people when brief glances take place as you walk by strangers. Sometimes a person is deep in thought, or on their phone, but a micro expression will be exchanged... That fleeting body language is something that happens unconsciously and yet it lies at the very base of our human connection with one another. The concourse corridor at uOttawa Station is the pedestrian tunnel where people pass each other all day long. My concept is to introduce an artwork that echoes the fleeting encounters we have with one another by situating 37 large-scale portraits based on cross-sections of people who frequent the university environment. These portraits will be purposefully taken out-of-focus so they "remind" us of people we might know but who remain elusive. Each face will contain a single word in either French or English that floats up between the artwork and the viewer. These words will be directed towards the viewer as potential reflections of the things going on in their individual lives, and so might resonate within their private thought patterns as they walk through the concourse. The faces in the black and white portraits will also appear to change their gaze, following the viewer at the same pace in which they are walking through the tunnel. This will create a flow/momentum between the portraits and the people, like a conversation. Derek Michael Besant is a Professor in Visual Arts at The Alberta College of Art + Design. His research working with the University of Alberta Health Law Department and the Stem Cell Research Foundation in Ottawa is directed at how the brain "sees." 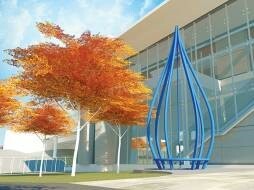 This artwork will utilize advanced technology to create optical encounters that will involve passing pedestrians. He lived in Ottawa as a child and has strong memories from that experience. This artwork contains and constructs a kind of remembrance of how we assemble what we know in our brains. That experience is not always clear, but invites us to construct our individual identity around it, which is what the artwork strives to do among perfect strangers. “Sphere Field” is a 2-meter cube of mirror and glass containing lights and a reflective sphere forming a sculptural observatory. While the spaces of the University of Ottawa and the uOttawa Station surrounding the artwork will change with time and season, “Sphere Field” will reflect that change while remaining unchanged itself. “Sphere Field” is part of an ongoing series of light boxes and reflective objects borne out of my curiosity, habits and history. As people move through the station, often several times a day, the sculpture provides opportunities for engagement and reflection. I hope “Sphere Field” becomes a location that generates questions, inquiries and discussions both about the work and questioning itself, bringing the viewer’s own life experiences within the fold of “Sphere Field”. Kenneth Emig is a transdisciplinary artist who integrates visual art, dance, sound and technology into his practice. His visual art encompasses wall works, sculpture, installation, stage design and public art. Kenneth explores perceptions, senses and environment, influenced by the process, methods and materials of high tech research, design and global manufacturing. His work is a response to the world around him, focusing his curiosity and observations, and he hopes to encourage awareness and curiosity of the world around us. Lees Station is located between Lees Avenue and the Highway 417 overpasses. The station provides light rail access to nearby residential towers, and quick connections between the University of Ottawa’s Lees and main campuses. In keeping with the nearby young and vibrant community, a new and continuous multi-use pathway will be located at platform level outside of the fare-paid zone. This pathway will extend from uOttawa Station in the west to Hurdman Station to the east, providing convenient access for both pedestrians and cyclists. In addition, all current multi-use pathway connections will reopen once the station is complete. 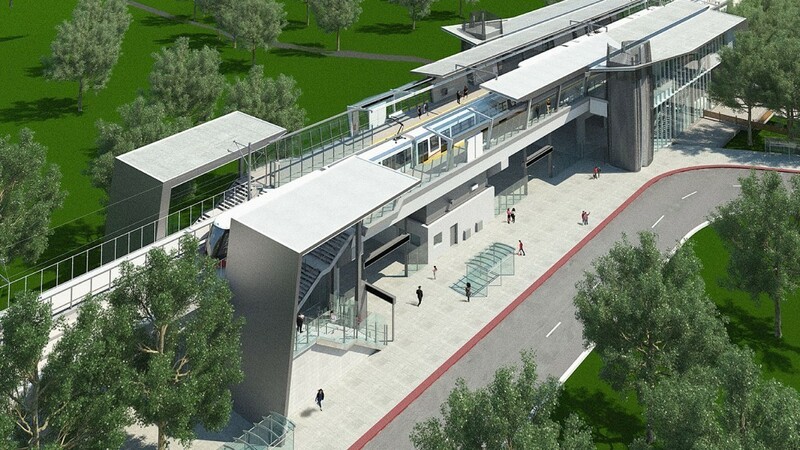 The ramp, stairs and plaza next to the existing station will be replaced with a new plaza, which will include safer and more efficient cycling and pedestrian connections to the station. The station and the surrounding landscaped areas are designed to provide convenient access for both pedestrians and cyclists. Transparent Passage will consist of layered patterns on glass and sculptural elements of a bird in flight. These will line the westbound multi-use pathway and will be within view from the eastbound platform. Amy Thompson is a mixed media artist that uses nature and narrative as inspiration. Her work explores themes of memory and the natural world through drawing, collage and sculpture. Her subjects exist both within and without our reality, straddling and exploring the spaces in between. 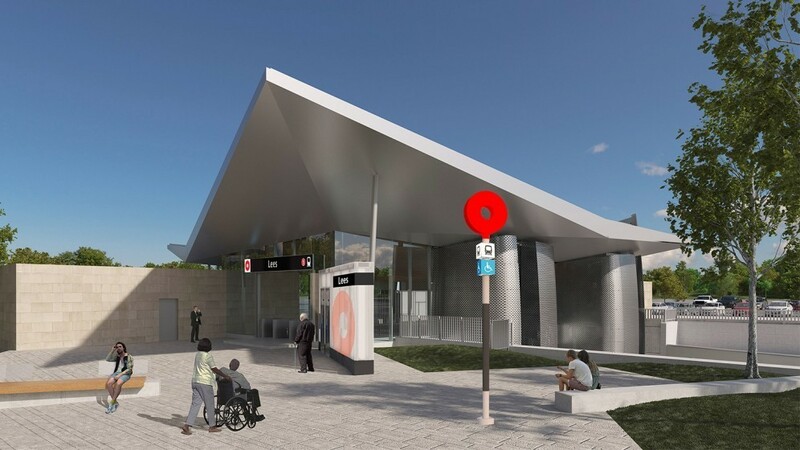 When the O-Train Confederation Line goes into service, Hurdman Station will continue to be a major connection hub for transit users along the Southeast Transitway. The new Hurdman Station has been designed with a large public plaza, which will feature green space and areas where customers can sit and relax. Overall, the space is designed to help incorporate the station more completely into the community. The guideway will be elevated to allow for potential new development north of the station. The station provides for quick and efficient transfers to and from a new fare-paid zone bus loop, meaning customers can bypass the fare gate and go directly to the train platform for boarding. The central concourse area will be directly adjacent to both the bus loop area and the pedestrian entry plaza, and customers will be able to transfer easily from bus to train or train to bus from either the westbound or eastbound platforms. Hurdman Station will be an important gateway to nearby communities. Located just steps from the Rideau River and residential towers, the station will offer connections to surrounding multi-use pathways and routes, as well as access to businesses near Industrial Avenue and Riverside Drive. The new station design also makes room for a new customer drop-off area on the south side, making it easier for customers to access buses and the Confederation Line. New larger and enclosed shelters on the bus platform. This unique painted metal structure will be suspended from the station walls, mimicking flight patterns of birds. Coordinated Movement is inspired by the location of the Hurdman Station which sits at the edge of the Ottawa River, marking a threshold between the natural world and the man-made one. This unique site marks both a node along the Atlantic Flyway, one of North America’s most significant stops for migrating water fowl, as well as one of Ottawa’s most important hubs for multimodal transportation. The work investigates the relationship between bird migration and human commuting through an exploration of the choreography of dynamic movement systems. Referencing maps, aerial photographs, diagrams of transportation infrastructure, avian flying routes and flock formations, Coordinated Movement explores the relationship between the ephemeral and the physical, the natural and the infrastructural, whilst questioning the inter-relationship between individuals and species. Jill Anholt is a visual artist based in Vancouver, BC who has been creating site-specific works in the public realm since 1998. Anholt’s practice ranges from complex integrated works in parks, pedestrian walkways and transit stations to small scale installations in buildings and public plazas across North America. Her installations explore the relationship between nature and infrastructure, body and place, revealing layers of personal and cultural memory and experience. Environmental sustainability plays a generative role in the conceptual development, form and material expression of many of her works. Along with her art practice, Anholt is an instructor at Emily Carr University of Art and Design in Vancouver. Ottawa travellers can look forward to quick and easy access to the Ottawa VIA Rail Station when Tremblay Station opens on the new O-Train Confederation Line. By making it easier to get to the VIA station using LRT, Tremblay Station will help to make out-of-town travel more efficient by reducing passengers’ reliance on cars and the associated costs of long-term parking. For tourists or visitors coming from out of town, the new connection will make it easier to get to some of Ottawa’s biggest attractions. Located northwest of the VIA Rail Station entrance, Tremblay Station will blend in with the existing entrance bridge. 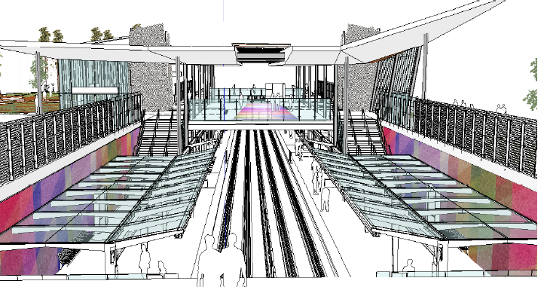 A covered pedestrian walkway will take customers to and from the VIA Rail terminal building, with stairs and elevators allowing fast and efficient movement between Tremblay Station’s upper concourse and the Confederation Line platforms below. The new station will also include a large public plaza on the south side of the Tremblay Station building. In addition to making the station more inviting, the plaza will offer a relaxing arrival/departure area for all visitors to the VIA Rail Station. The added green space will also help the O-Train station blend in with existing multi-use pathways for both pedestrians and cyclists, and sheltered bicycle parking will be located in a well-lit area near the station entrance. The station will also provide easy access to the Max Keeping Bridge, the pedestrian and cycling bridge, which will safely take people across the Queensway to and from the station to places like the Ottawa baseball stadium, hotels and other businesses, as well as to the residential communities of Overbrook and Vanier. National Garden is an imaginary landscape composed of the official flowers from each Canadian province, territory and the City of Ottawa. Situated alongside the VIA Rail Station, the sculptural plaza canopy recognizes the faraway destinations that can be reached by train and acknowledges the distant places that travellers may have come from. The flowers are mementos from abroad. National Garden celebrates both the romance of travel and recognizes, through the depiction of vernacular flowers, the unique and delicate qualities of Canadian culture and the physical landscape. Mirrored finish stainless steel panels will be integrated onto the underside of the glass canopy over the pedestrian walkway towards the station from the VIA Rail Station. The panels will have cut-outs with fold over pieces depicting various silhouettes of provincial and territorial flowers, and Ottawa's municipal flower. Jyhling Lee is a public artist and active contributor to the cultural community. She is passionate about the socially enabling role of public art and design in place-making within the built environment. For Lee, public art and public space making is situated between the realm of art, architecture, and urban design. Common in her work is the desire to inspire the civic imagination and to enhance the human experience of a place. Through Figureground Studio, she has been involved in a wide range of projects across Ontario and the Prairies. St-Laurent Station has been designed so that customers will still have easy access to the St. Laurent Shopping Centre. The current pedestrian entries to the stations from the existing bus platform will be maintained, but platforms will be expanded and the former Transitway has been converted to accommodate the new light rail system. The four existing escalators are being replaced and two new elevators are being added to ensure accessible and efficient customer flow between the St. Laurent Shopping Centre and the Confederation Line platforms. The underground walkway connecting the station with Tremblay Road will be reopened and will allow access between St-Laurent Station and the communities, businesses and restaurants south of Highway 417. This walkway will connect directly to the eastbound platform, allowing access to the shopping centre by way of an overpass. Integrated bus loop to make connecting between bus and train easy and quick. Three large, immersive murals painted by the artist will depict re-imagined Canadian histories. Two of the murals will be located on the westbound platform, while the third will be a corner-split mural on the eastbound platform. Andrew Morrow is a contemporary Canadian painter whose work is characterized by a restless desire to both inhabit and extend historical, narrative painting. Working from personal, actual, and invented histories, Morrow’s paintings engage broad historical themes such as war, eroticism, beauty, the apocalypse, and death, complicating these through a resistance to narrative closure and spatial coherence. In his murals for the St-Laurent Station, Morrow combines large-scale digital printing technology with physical painting to produce three site-specific and archival murals. Drawing on formal conventions from Western history painting and early Canadian photographic and narrative history, the murals reflect an uncertain, fragmented negotiation of both Canadian history and history painting itself. Populated by figures at work and at rest, these dreamlike paintings present a complex and shifting Canadian landscape, where the gravity of addressing a painted National history is balanced by individual moments of beauty and connection. Andrew Morrow holds a Bachelor of Fine Arts degree from Queen’s University and a Master of Fine Arts degree from the University of Ottawa. His work has been widely exhibited and reviewed throughout Canada and abroad. In addition to his practice as an artist, Morrow is a professor at the University of Ottawa, and a board member with the Ottawa Arts Council. Morrow lives in Chelsea, QC, with his wife and two sons. Running under Cyrville Road north of Highway 417, the improved connectivity to public transit will be an attractive feature that promises to draw people to live in the growing residential neighbourhoods nearby. It will also increase access to commercial office buildings in the area. Cyrville Station is projected to spur future growth in the community by making it easier for neighbourhood commuters to quickly get downtown and beyond. The station will include a new customer friendly, accessible, at-grade main entry plaza on the east side of Cyrville Road, as well as a secondary accessible entrance on the west side. The two entrances and surrounding multi-use pathways will offer direct access to both sides of Cyrville Road. Pedestrian and cycling paths, as well as covered bike racks, have been integrated into the station design to improve customer access, and the design also allows for connections to possible future pathways from adjacent developments. Cyclists will have access to bike racks and bike “runnels,” which will allow cyclists to easily walk their bikes up and down stairs. 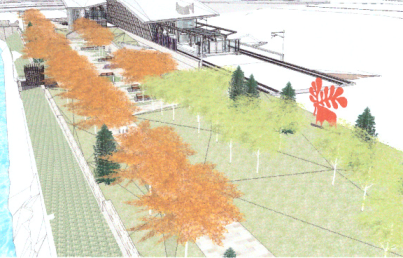 Thirteen slender stainless steel birch trees, measuring 7.3 metres tall, will be located on the north end of the Cyrville Station platform surrounded by prairie grasses. “For thousands of years, indigenous peoples have used the bark from birch trees to build their canoes. They traveled on the Gatineau, Rideau and Ottawa rivers to trade, hunt and meet with family and friends. Things have not changed much. Don Maynard lives and works in Kingston. He recently won two public art competitions for Falling Star for the City of Ottawa and Wave for the City of Toronto. He is the recipient of a Pollock-Krasner Foundation Grant (2009). Solo exhibitions include: Tidal Mass, Cambridge Galleries, Ontario; Franken Forest, Agnes Etherington Art Centre, Kingston, Ontario and Robert McLaughlin Gallery, Oshawa, Ontario (2010); and Looks Like Rain, MacLaren Art Centre, Barrie, Ontario (2008). He was featured in CAFKA’s 2009 Biennale, Veracity, in Kitchener-Waterloo, Ontario. He is represented by Newzones Gallery in Calgary, Alberta, and Sears-Peyton Gallery in New York, New York. As the easternmost point of the O-Train Confederation Line, Blair Station will be one of the system’s busiest transit hubs. It will offer easy transfers between light rail and buses, as well as access to local commercial and residential areas. Customers will be drawn to the shops, offices, businesses, restaurants and cinemas at both Gloucester Centre and Scotiabank Theatre Ottawa (formerly SilverCity). Blair station has been designed with a number of features to facilitate the high flow of traffic. While the centre platform is being built within the footprint of the previous Blair Transitway station, a dedicated bus loop, designed within a fare-paid zone, will make transferring between buses and the Confederation Line quick, efficient, and easy. Customers transferring between bus and train will not need to pass through the fare gate or revalidate payment. Escalators, elevators and stairs will then allow customers to move between the lower concourse and the Confederation Line platform. The station will provide an accessible transit gateway to the surrounding community. From within the station, customers will have direct access to both the pedestrian overpass above, the bus loop area below, and the surrounding multi-use pathways. Such connections will also make it easier and safer for cyclists to access the new, well-lit and covered bicycle parking facilities. Lightscape will consist of thirty suspended screens; airy, binary code-like pieces that use thousands of small dichroic glass ‘flags’ to announce the stairwells and tracks and move in response to the air currents of the trains as they come and go. Inspired by the sunrise, a metaphor for awakening imagination, Lightscape is informed by the proximity to Ottawa’s national centres for research, science, security and observation. Artists cj fleury and Catherine Widgery married elements of space research, mathematical order, colour and light with the movement of wind, trains and people. Thirty code-like screens, using thousands of dichroic glass rectangles, announce the stairwells and tracks. Blair Station becomes a breathing organism, where the shimmering screens respond to rushes of air from incoming trains and weather. Ethereal, ephemeral, structured, these luminous veils of glimmering bits are animated representations of the activity and energy of this station and this city: blooms of code, evolving ideas, flows of shifting light, reflections and pattern. Readable on many levels, the art expresses a commingling of precision and chance, science and art, natural, digital, and imaginary realms. cj fleury is interested in the human spirit, common ground and social engagement. She has completed seventeen public commissions (Quebec, Ontario), working with bronze, stone, chromed, enamelled and raw steel, concrete, video, light and text. Formed initially as a choreographer, fleury considers how viewers move through an environment, interacting with scale, shape, image, idea, and each other. She is best known for innovative collaborations with diverse communities; site-users and stakeholders consistently demonstrate appreciation and a sense of ownership. fleury has been invited to present her work and approach in museums, arts councils and universities in the contexts of labour, social science, activism and law. Catherine Widgery and her team have built more than 40 site-specific public art projects across the US and Canada. In addition to numerous solo and group exhibitions in galleries and museums, her award-winning projects have been featured on the covers of Sculpture, Landscape Architecture, Espace and World Sculpture News magazines. Her particular interest and strength is working with communities and teams to create environmental sculptural experiences that respond to the unique spirit and shape of a place. The use of wind, light, water and computer controlled lighting programs communicate energy and animate the space within her environmental works. Widgery’s experienced team of talented specialists mean that projects are produced on time and within budget. She knows the best projects are the result of a lively dialogue with the stakeholders and design team.